Behold the wrath at Casumo Casino! Playing the Viking Runecraft can sound both complicated and easy at the same time. Apparently, there are 4,000 levels that you can get through – you begin your journey, of course, as a journeyman and then you become a Viking warrior. After several levels, you then end up in Valhalla. But the basics of the game is simple – you win with every 5 or more cluster of symbols and winning symbols will explode, allowing for more to topple from above. However, what makes Viking Runecraft really attractive is its four bonus wild features that are bound to keep you occupied throughout the game. Even better that, there is an in-game jackpot that is triggered with every level going up and more bonus features triggered with more winning chain reactions. Viking Runecraft mobile slot is a six reel, all-ways-payline slot allows you to bet anything between 10p and £100 per line, making it accessible to players with any sized budget. The Viking Runecraft has medium – high volatility compared to most games which means you will have to trigger the bonus features in this game every now and then to be able to maintain a bank balance neutrality. Having that out of the way, I personally feel that this mobile slot is better suited to the slot enthusiasts rather than to casual players. You would have to bank on activating the bonus features in this game in order to make it big. If your plan is just to play this game for a few minutes, it may not be as good of an idea because you may not end up triggering any of the onus features at all. In terms of payouts, I personally feel that Viking Runecraft can do better, although from my experience playing this game for a solid 30 minutes, the payout frequency and size was sub-par, maybe even below average for the volatility of the game. Oh, and before I forget to mention, if all your stars align, you can with win up to a staggering £500,000 in this slot. Despite that, what is striking is that the house edge is only 3.3% meaning that there is a high return to player rate at 96.7%. Not forgetting, the increasing jackpot amount as you go up the levels proves to be the real eye-catcher of the game. This video slot by Play’n GO mobile slot sounds, looks and plays beautiful. What’s great about it is that Play’n GO have optimized their mobile casino games on a vast range of platforms including Android, Apple and on PC. So, performance is the least you should worry about when playing Viking Runecraft. Players more often than not get mesmerized by these great Norse gods and the powerful, intense Viking drum music as they play on. Game Features: Gods Bonuses, Extra Spins! The bonus feature department is where Viking Runecraft excels at. Play N’ Go have truly outdone themselves by integrating video game like features (the levelling system) in a mobile slot game. If hitting on bonuses is what gets you at the edge of your seat, then Viking Runecraft is the game for you. With 4,000 levels in the game and having different Gift of the Gods feature on each changing level that triggers the Runes of Valhalla bonus, Viking Runecraft doesn’t get boring. You level up very easily by getting wins over preset patterns on the grid. Here are some descriptions about the Gift of the Gods Features, each having their own unique random feature that triggers after any spin. The most enticing part of the game is probably getting your winnings multiplied by 15x. This mini-in-game jackpot gets better as you get to higher levels because as you play on each level, you win any of the five different Runes of Valhalla symbols and these collect in the mini in-game jackpot. 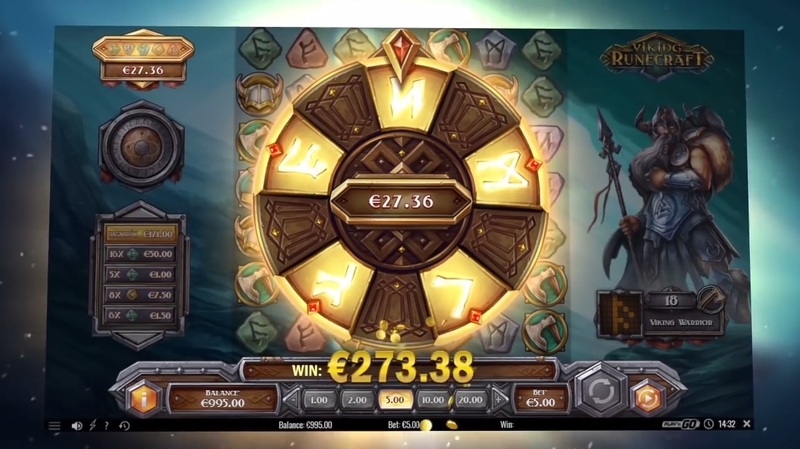 As you go up the levels, the bonus wheel appears and spaces will light up, but this depends on the number of runes collected. If you hit the light up spaces, you win the cash bonus. The more you win, the higher the chances you get to win more – this is not something you see in a lot of games. In Viking Runecraft, here’s the appeal of the Charge of Destruction. When you win 20 symbols (at once or consecutively), you trigger any of these four special features. Fury of Fenrir: in the selected four diagonal lines of symbols, two are removed and the other two changes to the same symbol. Judgement of Jörmungandr: in a selected chain of symbols on the grid, most are destroyed while some are transformed to the same symbol. Scorching of Surtr: in the selected three different symbols, surrounding symbols are destroyed and the selected symbols are duplicated. Lure of Loki: all of two different symbols are selected where one group is destroyed and the other transformed to the same symbol. With a win of 40 symbols (as usual, at once or consecutively), there will be a free round called the Ragnarök extra spins. If there are no wins during extra spins, a Charge of Destruction feature triggers once at a time and the Ragnarok feature ends when all four different charges have been triggered. The Charge of Destruction wheel is then turned into a multiplier wheel. Want to play Viking Runecraft? Viking Runecraft Once you start, it’s not easy to turn back. The bonus features keep getting you to hope that either Thor, Odin, or Loki will help you after a few spins. This is another instant hit by Play’n GO, who are famous for doing things differently but supercharging it to another level. The level on interaction in this game is second to none and quite frankly if you asked me, I would say this slot game can almost qualify to be a slot video game by itself. I mean, how many other slot games that you know of comes with different levels in gameplay and rewards you in tiers of cash prizes? The storyline and the theme that Viking Runecraft revolves around is immensely interesting. Every graphic detail works hand in hand with the storyline that Play N’ Go wants to deliver and this just elevates the whole gaming experience to a whole new level. One thing for sure, there are no easy roads to reach the gods -- to make it big, you got to stay on in order to hit multiple features and big wins.